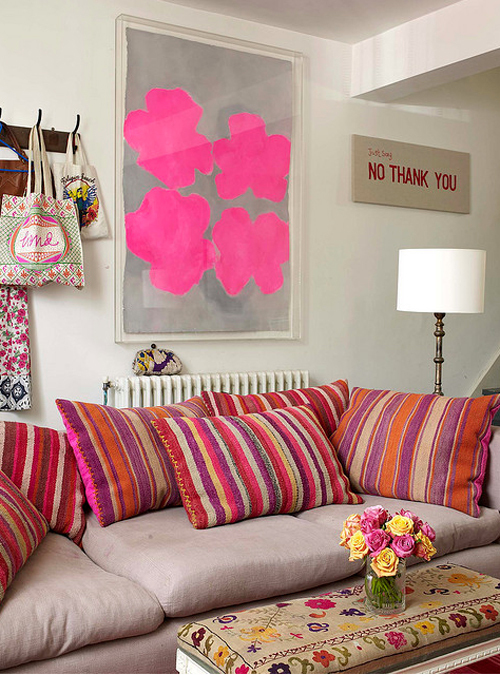 More cushion love today! Aren’t these gorgeous? This image is from Selina Lake’s book Bazaar Style (photography by Debi Treloar). Does anyone know where to get similar cushions? I think many you would like to know! These are so fun! I love how the rest of the room is styled with bright accents too. these are vintage guatemalan and peruvian woven blankets that have been turned into fabulous pillows. They also work up great as textiles to upholster simple stools and chairs. these are very typical examples of the type of bright colors that they often use in their weaving – oranges, fuschias, hot pinks, purples and reds. check out etsy + search for “kilim” or even ebay…i have a bunch of pillows set as my favs on etsy. i love these as well! This is already in my favorites, it looks like summer! Love the table with tthe table cushion..just wonderful! She sells them in her shop “The Cross” in London. Not cheap but the very same, and so soft! Lovely! It’s a bit far, but you could try Elementos Argentinos in Buenos Aires! We bought a lovely blanket there and saw many striped woven rugs and pillows, made with natural, local dyes. But I wish I could step out of my house and source these cushions down the block. So lovely. Does anyone know anything about the wall art and where I could possibly find the print? Thank you so much! Anything even similar would be helpful in terms of style/bright pops of color.